Come along and see how Australian Lions Hearing Dogs are changing the lives of Deaf and hard of hearing people Australia wide. Our dogs will show you how they alert their owner to a door bell, and a smoke alarm. You will get to go on a tour of the training facility and view all of our dog yards, night kennels, enrichment yard and our history room. On the day, you will be free to stroll through our new garden, introduce yourselves to our dogs in training, say hello to some alpacas, get your face painted, and peruse some market stalls! It promises to be a fun filled family day in the heart of the Adelaide Hills. 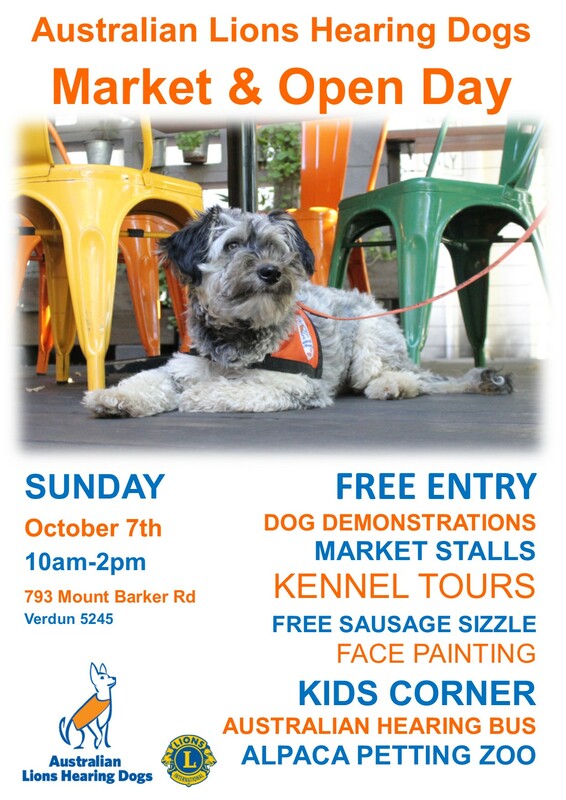 Free entry, free hearing tests from Australian Hearing, free sausage sizzle and free face painting. There's something for everyone! *please note- although this is a dog orientated event, no pet dogs will be permitted on our premises, with the exception of service dogs.